When you get your braces on, Drs. Thomas and Claire Marcel will give you an interdental toothbrush that can be used to get to those hard-to-reach spots in your mouth. The brush has bristles that can easily remove food residue stuck between the wires in your mouth. We may also suggest using a WaterPik, which pulses a pressurized stream of water to remove excess food particles. Brushing and flossing every day should always be a part of your oral health regimen, but this becomes especially crucial when you have braces. If food gets stuck between braces and sits on your teeth, decay and staining will start to occur. Drs. Thomas and Claire Marcel and our team recommend flossing at least once a day, and brushing and using mouthwash after every meal as long as you have braces. The purpose of braces and other forms of orthodontic treatment at Marcel Orthodontics is to correct malocclusion, also known as crooked or crowded teeth, or “bad bites.” Past orthodontic practice dictated that wisdom teeth be removed, especially in cases of crowding. Drs. Thomas and Claire Marcel will tell you that in some cases, wisdom teeth attempt to come in the wrong way, either tilting in the jaw, or sideways. If the mouth is too small to accommodate these additional teeth, they inevitably become impacted. Swelling or infection of the gum flap above an impacted wisdom tooth may cause pain. The greatest danger is pericoronitis, a potentially dangerous infection that can occur in the gum area around an impacted wisdom tooth, or around a wisdom tooth that has erupted. Orthodontists base their decision to remove wisdom teeth on each patient's individual circumstances. To learn more about the impact wisdom teeth have on orthodontic treatment, or to schedule a visit with Drs. Thomas and Claire Marcel, please give us a call at our convenient Livermore, CA office! It's springtime and it's again time to remind our patients at Marcel Orthodontics to protect their faces and pearly whites while out on the field playing sports. According to the National Youth Sports Safety Foundation, children, high-school athletes and adults have more than 5,000,000 teeth knocked out in sporting events annually. Having a mouthguard can make the difference between losing your teeth or not, and because many of our patients who play high school sports have jaws that are still growing, last year’s mouthguard may no longer fit as it should. Drs. Thomas and Claire Marcel and our team at Marcel Orthodontics can fit you for a new guard. 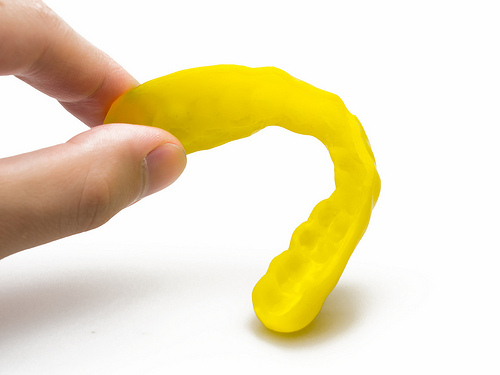 To learn more about mouthguards or for general questions about your treatment at our Livermore, CA office, please give us a call! While everyone’s teeth and dental needs are different, there are certain things everyone can do to make wearing their Invisalign aligners a more rewarding experience. Always follow the list of instructions and tips from Drs. Thomas and Claire Marcel, and add the following advice to your daily routine. Always ask us about teeth whitening. Our team at Marcel Orthodontics knows how important it is for you to keep your teeth white and stain-free from the foods and drinks you consume daily. If you have attachments to your teeth, they will not whiten properly. Ask our office about teeth whitening when wearing your aligners; it might be best to wait until your treatment is complete. You may experience slight discomfort while wearing your Invisalign aligners. You can take a pain reliever to help with the discomfort, but if you experience too much pain, please give us a call at our convenient Livermore, CA office to schedule an appointment!